CLEVELAND — Oklahoma City All-Star point guard Russell Westbrook will sit out tonight’s game against the Cavaliers to rest his right knee. 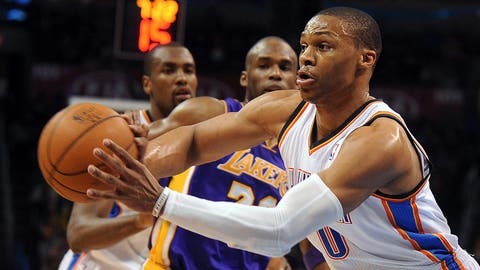 Westbrook had surgery earlier this season, and the team is being careful with one of its star players. Oklahoma City plays Friday night in Toronto, and coach Scott Brooks said part of Westbrook’s post-surgery protocol is to occasionally sit out when the team has back-to-back games. Reggie Jackson will start at point for Westbrook, who averages 21.4 points and 7.2 rebounds. Jackson will make his 32nd start this season. The Cavs, too, are without two of their best players. All-Star Kyrie Irving is expected to be out two weeks with a strained biceps tendon, and forward Luol Deng will miss his second game in a row with a sore ankle.